Home » » Fatalities as junior hockey team's bus and lorry collide in Canada. Fatalities as junior hockey team's bus and lorry collide in Canada. Police have confirmed multiple deaths after a lorry and a bus carrying a Canadian junior ice hockey team collided on Friday evening. 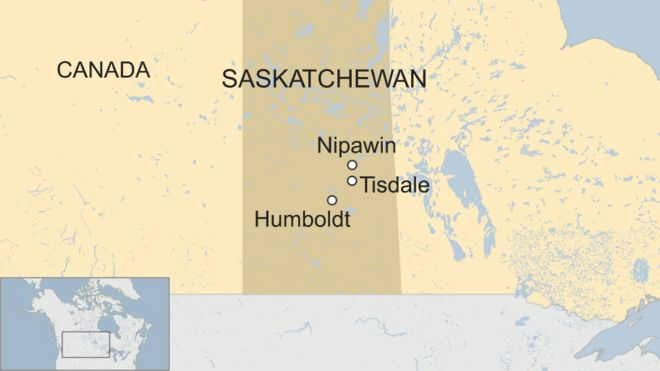 The Humboldt Broncos were travelling on Highway 35, north of Tisdale in the province of Saskatchewan. The Royal Canadian Mounted Police said they could not yet confirm the number of dead or injured. In a tweet, Prime Minister Justin Trudeau wrote: "I cannot imagine what these parents are going through". The lorry and the bus collided at around 17:00 local time (23:00 GMT). The Humboldt Broncos, who play in the Saskatchewan Junior Hockey League, were en route to a play-off game against the Nipawin Hawks. The province's junior hockey league is open to North American players under the age of 20. Royal Canadian Mounted Police inspector Ted Munro said rescue efforts were ongoing and that they had set up an information and support centre for families at the Nipawin Apostolic Church. "Our thoughts and prayers are with the families tonight," he said. Myles Shumlanski, father to one of the Broncos players, arrived at the scene after a call from his son. "It was a disaster," he told the Saskatoon Star Phoenix paper. "We had a crane lifting the bus." The president of the team, Kevin Garinger, found out about the accident after a fan called him. "We are just in utter disbelief and shock at the loss that's fallen upon us," he told the CBC. Darren Opp, the president of the Nipawin Hawks, told the Globe and Mail: "It's a horrible accident, my God, it's very, very bad.